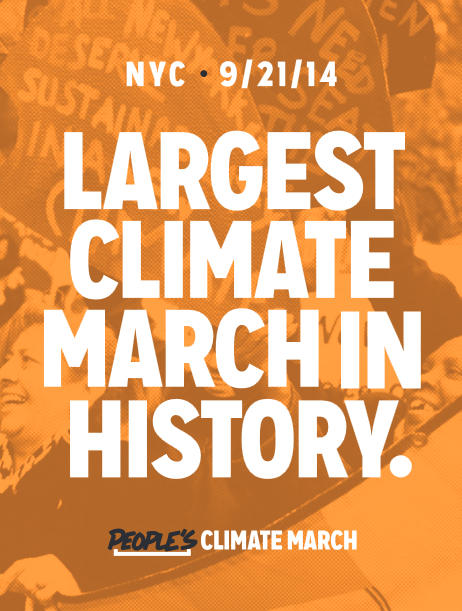 Activists Worldwide launch Largest Climate March ever Sep 21st! A very well organized campaign is underway to kick off what is said to be the largest climate protest in US History tomorrow. Based in New York City primarily, but spanning the whole world and indeed reaching as far as Africa, Brazil, UK and many other countries. With solidarity marches planned in thousands of cities. NYC Alone is reported to have over 100k due to attend. More than 2,000 “People’s Climate” events are now planned worldwide in 150 countries . In rural Papua New Guinea, students from a primary school will march to a nearby lighthouse which has recently become semi-submerged due to rising sea levels. The border between Vancouver and Seattle will be the location of a truly international rally where thousands of people will link hands across the boundary line to show that climate change knows no borders. In Lagos, plans are underway for a historic climate march through the streets of Africa’s largest city. They will be joined by solidarity events in rural areas throughout Nigeria. In Tanzania, the Maasai plan to march calling for action from their ancient homelands in the Serengeti. In London environment organisations and faith groups are combining forces to create what will be a historic march through the city to the steps of Parliament. In Rio, thousands are expected to march on the beaches of Ipanema, while images will be broadcast on the statue of Christ the Redeemer in the week building up to the march. In Australia, an epic Climate March will convene in Melbourne afterwards a group will walk 700 km along the eastern seaboard to the nation’s capital Canberra arriving at the Parliament, to raise awareness about climate impacts. In Bogota, Colombia, over 10,000 people are expected to join the march through the capital calling for action. In Berlin, a silent parade, a stream of cyclists and a march for children will converge on the Brandenburg gate. In Paris, local groups will create the “Paris Marche pour le Climat,” with parades, marches, and bicycle rides planned across the bridges of the Seine. Over 30 celebrities have also begun showing support for the march, including UN Goodwill Ambassador for Biodiversity and actor Edward Norton, His Serene Highness Prince Albert II of Monaco, as well Argentine footballer Lionel Messi .